I arrived in downtown St. Pete mere minutes before rock band Umphrey’s Mcgee was set to take the stage at Jannus Live on the Sunday of Labor Day weekend. As I approached this distinct open-aired venue, my eyes glimpsed a queue of people eager for tickets wrapping around the corner and halfway down the next block. The hype for tonight’s show was certainly established. I passed through security ventured into the venue where I witnessed the crowd energy was also at sufficient levels for a memorable performance. Satisfied, I bee-lined for the bar and scooped a beer. While sipping the brew I observed key variables about the crowd and setting that would affect tonight’s performance. 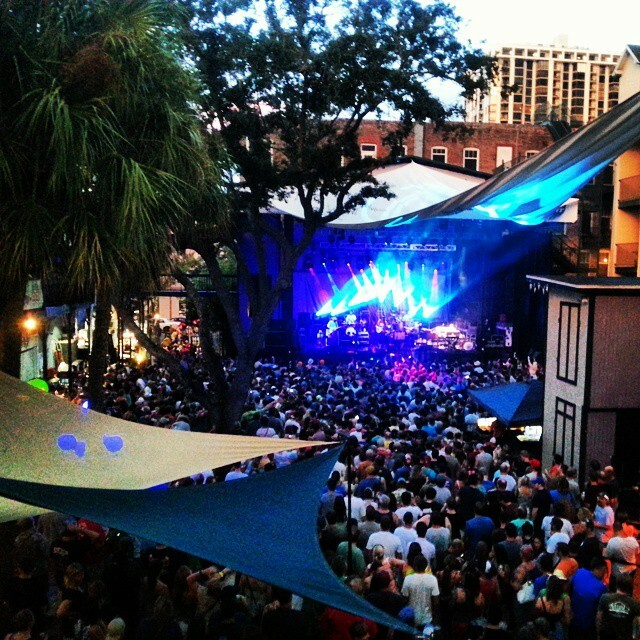 Jannus Live has a unique design. It is shaped like a square with the entrance and stage on top, bars on the left and back sides and apartments gracing about half the right side. This gives it a ‘Wrigley Field’ feel as apartments balconies face toward the stage so tenants can observe all the concert action. The crowd was an eclectic mix of rock-conscious youth, hardened hippies, and middle aged couples trying to relive party days in the 80’s. The diversity did not surprise me because Umphrey’s has hustled hard this summer, not only releasing an album but supporting it with tour stops from Red Rocks to Bonaroo to London. Jannus was at max capacity tonight, with the full complement of fans lined up from one side to the other and as far back as possible. I soon found my friend and we enter the masses. Within seconds, a procession of cheers erupted and the band emerged as the sun was beginning its daily surrender to the night sky. The sextet took their positions in the form of Jake Cinninger (guitar), Brendan Bayliss (guitar), Ryan Stasik (bass) and Joel Cummins (keys) in front supported by Kris Myers (drums) and Andy Farag (percussion) behind them. They immediately established an electronic backbeat before Jake entered the scene with metal inspired riffs. After a minute of warming up, UM transitioned into their first full-length track entitled “Mulche’s Odyssey”. The song featured hard rock jamming reinforced with blue lights and smoke to createimagery of the sea . This seemed appropriate being that the venue is just two blocks from Tampa Bay. The next song “Nemo” continued this early vibe by opening up into an expansive ten minute heavy rock improvisational run. After, Bayliss addressed the crowd explaining the band wanted a Friday night (party) feel for tonight. In an interview with Jambands.com, keyboardist Joel Cummins reveals that the band takes the day of the week into account when determining what type of show to play. ”by Sunday, people are just super burnt”, thus those shows ,”are the ones where we’ll get a little bit more experimental and maybe do some things that we haven’t been doing very recently.” That could explain why they elected to go with a metal/electronic mix for a majority of the first set. Experimentation was in full force for the next song as UM played the funky Meters-inspired original “Soul Food” which included abstract jazz scating over electric guitar. The album standout “Bridgeless” was the next song, this gave lead guitarist Jake Cinninger his first chance to show off the his guitar mastery as he navigated seamlessly though riffs of ever increasing complexity. The shows first cover came soon after in the form of “Rock the Cashbah” by The Clash. This song archived the dual purpose of showcasing Umphrey’s late 70′s-early 80′s rock roots and highlighting the ability to make any song uniquely their own vocally as well as musically. UM soon concluded the first set with an awe-inspiring rendition of the song “Slacker”. This high-energy, electro tinged twelve minute jam was the high point of the first set. The most memorable moment was Jake finding his way over to the keys and igniting a sequence that mixed in the instrumental from hip-hop classic “The Message” by Grandmaster Flash. For Umphrey’s sometimes single phrases carry more weight than song lyrics, this was the case when at the end Bayliss stated “we’ve yet to give you our best yet”. A few minutes later, UM emerged for what would be a unforgettable second set. The opening track was the first song off the new album called “The Linear”. This selection allowed to band to establish a fast-paced vibe that would emanate for the remainder of the set. Another feature utilized during this song was the using lights to imitate psychedelic ballroom setting. 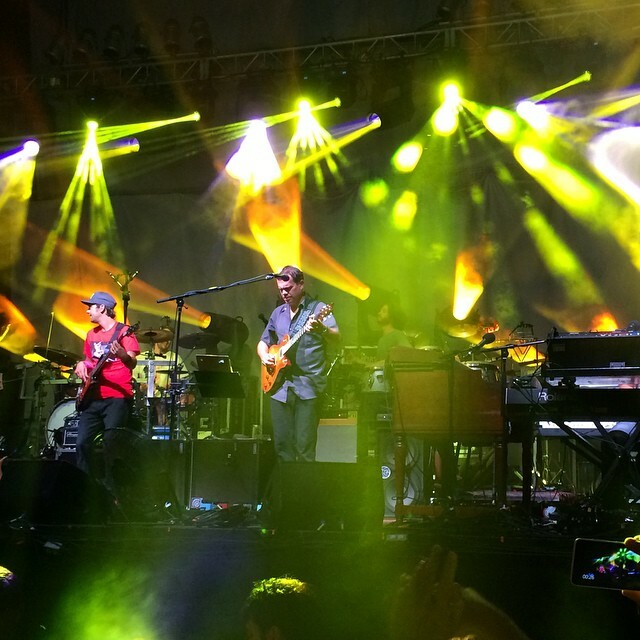 It is no secret that Umphrey’s lights are the most renown and advanced on the jam scene. But they went over the top on this occasion, with illuminated rotating white globes supported by bright spotlights and floor lighting that gave the band a dark blue hue. This differs from their typical routine which usually features fast-moving spotlights which rotate with riffs and change color with musical movement. The next song they played was “The Triple Wide” into “Deeper”. “Triple Wide” is the bands most prevalent for electronic jamming, during this they would showcase an uncanny ability to break music down then methodically rebuild it. A jam would begin with loose electronic elements before hand drums were stirred in with a slowly building guitar thunderstorm. The band would rinse and repeat this buildup for a few minutes before thanking the crowd for “going to church on Sunday” with them and entering into “Deeper”. After a metallic jam, Jake began to mix in guitar parts from “Exlospive” by Dr. Dre which only added to the overflowing energy. The next extended track was a cover of “Willie the Pimp” by Frank Zappa. Umphrey’s has made no secret of their affinity for Zappa,even discussing his influence in a recent interview with Musicradar.com. Explaining (Zappa is) “a lot of the reason why some of our sections of music are more complicated and just fury” and that listening to him “ Is like hearing Sgt. Pepper for the first time; it’s that impactful. It’s crazy” This cover was a turning point in the show where UM switched from a metal/electronic feel to a progressive/jam vibe.This was followed by an opened-ended version on “Bad Friday” which proved to be one of the lightest and grooviest tracks of the night. The progressive kick hit its peak when they covered “Tom Sawyer” by Rush. This cover served to further reveal to the audience the DNA from which Umphrey’s sound is built upon. They closed second set with original “Miss Tinkle’s Interlude” which culminated in a climactic guitar duel finale between Jake and Bayliss. “Running With The Devil” by Van Halen was the first song played in the encore, and it allowed Jake one last opportunity to wow the crowd with this masterful thunder. The final song of the night was fan favorite “In the Kitchen”, which turned into an eleven minute extended jam after UM started teasing “Wanna Be Starting Something” by Michael Jackson and the fans danced to the finish line. All in all, my visit to St. Pete provided a heavy rock show that reward attendees with a filling mix of familiar originals and influence-exposing covers.